This dazzling diamond engagement ring gives new meaning to the word elegant. You'll be thrilled by the fire that radiates from the beautiful, natural enhanced 1.0 carat cushion cut diamond in the center. This cushion cut diamond gleams with a SI1 clarity and D color grade. Surrounding the center stone along its base are glittering full cut round diamonds. 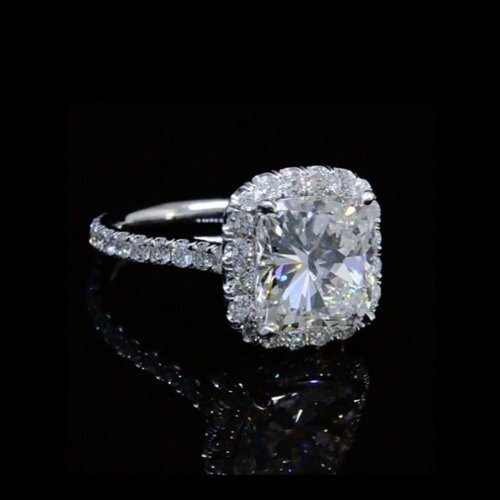 The round cut diamonds continues down the shank of the ring going three quarters of the way around the band. The side diamonds are displayed more prominently so that you can see each beautiful stone in its full brilliance. Underneath the main stone is elegant scrolling which adds to its stylish form. The side diamonds have a total combined weight of .58 carat SI1 clarity with a color grade of F. The stunning setting is created in 14kt white gold with a total metal weight of 4.10 grams. Matching wedding band available for an additional cost. For additional views, please contact us.